The leading repository of Haitian visual art, the Musée d’Art Haitien du Collège St Pierre, was severely damaged by the 2010 earthquake and has not been repaired. Haitian artists and collectors of Haitian art, residing on the island and abroad, have rallied to support the rebuilding by donating works to help fund it. The project has been assisted by the Wilmer Jennings Gallery which collaborated with the Toussaint Louverture Cultural Foundation to present a spirited exhibition and sale of an important selection of work donated by more than 80 Haitian artists, including many from the New York tri-state area. The Save A Museum show of exceptional, folk and contemporary Haitian art was held September 17-September 21, 2013 at the Wilmer Jennings Gallery in New York. Each work of art was chosen for its perceived influence or interpretation of the Haitian cultural realm. The exhibit brought together work by artists from several generations – masters such as Raphael Denis, Eric Girault, Emmanuel Merisier, Franketienne and Hervé Télémaque and rising talents such as Fritzvelt Antoine, Michelle Voltaire Marcelin, Marilène Phipps-Kettlewell, Essud Fungcap, Guy Syllien and Jonas Allen. The styles were diverse, ranging from figurative art to constructivism and to Art Informel; from naive to avant-garde art. The Saint Soleil artists, Lafortune Felix, Camy Rocher and Alexandre Grégoire, were represented with artists such as Robert Paret, Odile Latortue, Marithou, Ralph Allen and Edouard Duval-Carrié who received a classical education in the best schools. The works of these artists were mutually complementary; in all of them you found the spirit of Haitian art. The Musee d'Art Haitien du College St Pierre, a dream of Dewitt Peters, was built in 1972 in the historic center of Port-au-Prince Haiti. Most if its collection was donated by the Centre d'Art and Alfred Voegeli, bishop of the Episcopal Church of Haiti. The museum remains one of the few institutions that preserve the Haitian paintings of the 20th century. Its collection includes irreplaceable work from 1944-1945 to today. 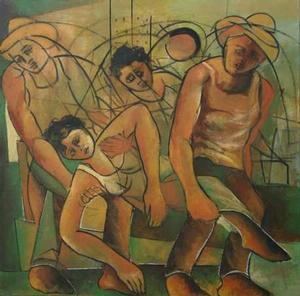 The collection contains the most prominent Haitian artists and some of their most outstanding work. Among them, Hector Hyppolite, Philomé, Obin, Senèque Obin, Lucien Price, Préfète Duffaut, Dieudonné Cédor, Luckner Lazard, Antonio Joseph, Bernard Wah, Raphael Denis, Tiga, and the Saint Soleil artists. Sculpture is also well represented in the collection with pieces by artists such as, among others, Patrick Vilaire, Ludovic Booz, André Dimanche, George Liautaud, and Serge Jolimeau. Three years after the catastrophic earthquake that hit Port-au-Prince January 12, 2010, the Musée d’Art Haitien, which was gravely hit, has not received the support it needs for its reconstruction. A report compiled after the disaster describes a dismal situation: disjunction and collapse of walls, cracks in the showroom, disintegration of the concrete. The damage to the building forces the museum to remain closed to the public. A total budget of about $220,000 is needed to repair it. The promises that were made, both by national and international institutions, one more attractive than the other, went no further than the spoken word. Despite its great importance to the Haiten economy and its major contributions to the culture, visual art was not a priority for those supervising the appropriation of restoration funds. To preserve this important part of their heritage, a group of fellow artists and art lovers living in the United States decided, with the approval of the museum’s executive committee and in accordance with its statutes, to form a support committee under the umbrella of the Toussaint Louverture Cultural Foundation. 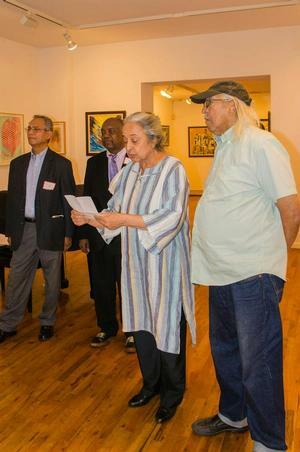 This committee informed the public about the museum’s situation, appealed to Haitian artists and organized the benefit exhibit at Wilmer Jennings. The 36 paintings sold at the Save A Museum exhibit at Wilmer Jennings raised $31,000 which will be used to start the repair of the building. The Support Committee is taking several other initiatives, including other exhibit/sales, to raise more funds. Artwork that was not sold at the Save A Museum exhibit/sale can be viewed on and purchased from the foundation’s website www.ToussaintLouvertureFoundation.org. The upcoming exhibitions will provide an excellent opportunity for collectors to acquire choice artworks as well as help Save A Museum. To be notified of upcoming exhibitions, contact the Foundation at: ToussaintLouvertureFoundation@gmail.com. Michel Philippe Lerebours, Ph.D.,is the chairman of the Musée d’Art Haitien Support Committee of New York and Vice Président du Comité d’Administration du Musée d’Art Haitien du Collège St Pierre, Port-au-Prince.